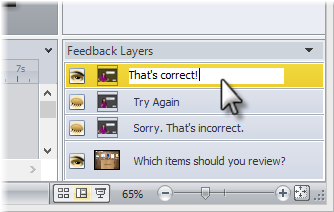 If you've enabled feedback in Articulate Quizmaker, it'll display on feedback layers in your quiz. When learners submit each question, a feedback layer will overlay the content of the question to show them how they performed. 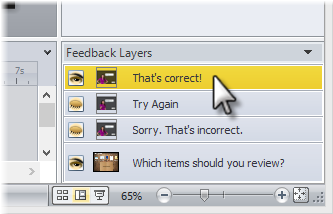 In Slide View, click any layer in the Feedback Layers panel in the lower right corner of the screen to display it. If the Feedback Layers panel is collapsed, click its title bar to expand it. Design each feedback layer with text, images, audio, video, and any other resources you want to use—just as you would design the base layer of a slide. 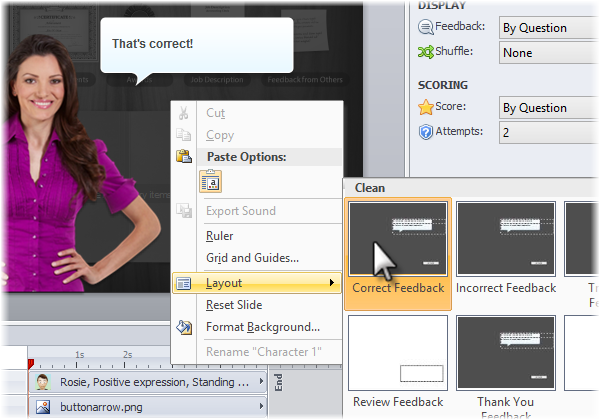 In Slide View, select the feedback layer you want to edit. Then right-click the slide workspace, scroll to Layout, and choose a layout. Go to the Animations tab on the Quizmaker ribbon. Choose a transition and a speed for the transition. If you want to apply the same transition to all the other feedback layers for the current slide, click Apply To All. To learn more about transitions, see this tutorial. 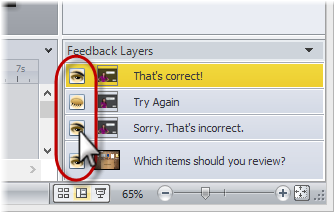 Select the feedback layer you want to edit. Open the timeline if it's not already visible. Scroll to the bottom of the timeline, and click the triangle in front of Base Layer Objects. This reveals all the objects that are located on the base layer of the slide. 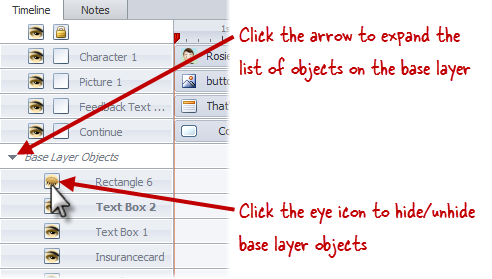 Click the eye icon beside any object to hide it. To learn more about the timeline, see this tutorial. Double click the name of a feedback layer to open it for editing. Press the Enter key on your keyboard to save the change. By default, feedback layers are invisible while you're working with the base layer of your slide. They become visible when you click them. If you need to display more than one feedback layer at the same time (for example, you might need to align objects the same way on different layers), click the eye icon in front of each layer that you want to show. Click it again to hide that layer.